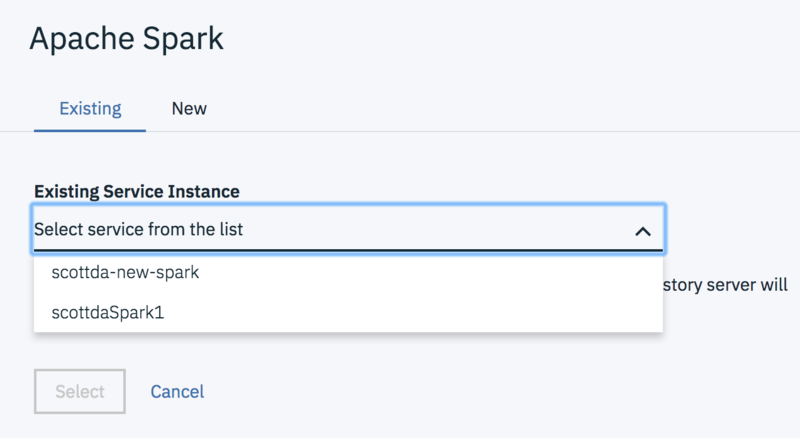 How to add a Spark service for use in a Jupyter notebook on IBM Watson Studio. In earlier releases, an Apache Spark service was available by default for IBM Watson Studio (formerly Data Science Experience). This was often not needed and inefficient, so the default Spark service was removed on March 20, 2018. However, if you do need the Spark service, this tutorial explains how you can add it. To set up a Spark service for use in Jupyter notebooks on Watson Studio. Log in or create an account for Watson Studio. This will take no more than 15 minutes. Set up a project in Watson Studio. In your project, go to the Settings tab. Scroll down to Associated Services, and choose + Add service > Spark. Either choose an Existing Spark service or create a New one. When you create a notebook, select the Spark runtime that you’ve associated with this project. Click the Create Notebook button. You should now be able to use an Apache Spark service in your notebook.